In 1965 DC were still selling comics to many children of men who’d seen service in World War II, and who’d fought against Germans. It was a reasonable bet that some of their elderly relations had even seen service in World War I. 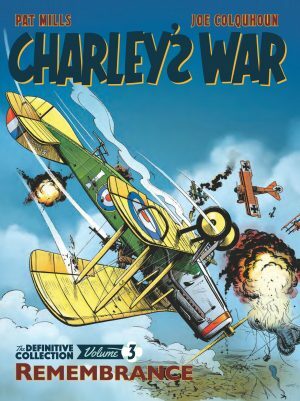 Therefore, making room in a war themed anthology for, if not a hero, then a protagonist who was a World War I German fighter pilot was taking a considerable chance in conservative times. 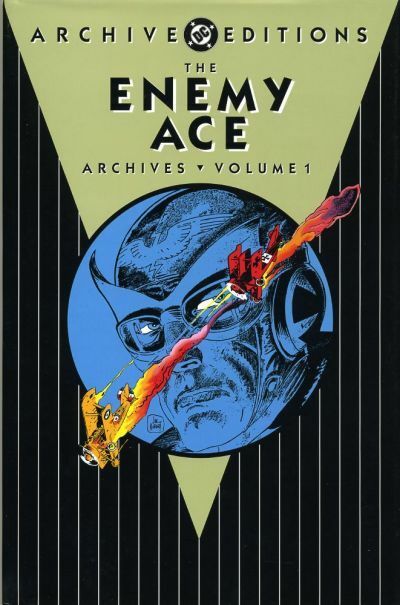 Robert Kanigher’s script for Enemy Ace’s introduction is a little florid in places, but the first person narrative is unusually introspective for a DC war comic of the period. Kanigher characterises Hans von Hammer as arrogant, yet noble; successful, yet unfulfilled, and distant and lonely despite the availability of all the friendship he could want, choosing instead to seek the company of the lone wolf with whom he identifies. Others can debate how much of his own notoriously intelligent, yet difficult personality Kanigher poured into von Hammer. The first outing is an effective distillation of gloom, but considerable repetition occurs over the earliest shorter stories. This is not only with aerial combat, but his fellow pilots despising the brooding von Hammer behind his back, his pointing a rifle at the wolf with no intention of shooting it, and jokes from his orderly about the cups he’s earned for his kills. 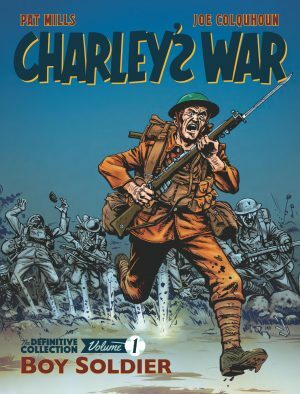 The first longer strip is in effect a combination of the three earlier ones, and the feeling becomes that Joe Kubert’s artwork is carrying more than its weight. Kubert’s art is stunning throughout, and a serious contender for among the best of a long and distinguished career. He’s aware of the repetitive visual nature of aerial combat and varies his layouts to prioritise different viewpoints, and combines that with detailed research to ensure period accuracy. Any page at random is superbly composed, and his definition of Von Hammer’s melancholy intensity is a powerful study of a conflicted man. 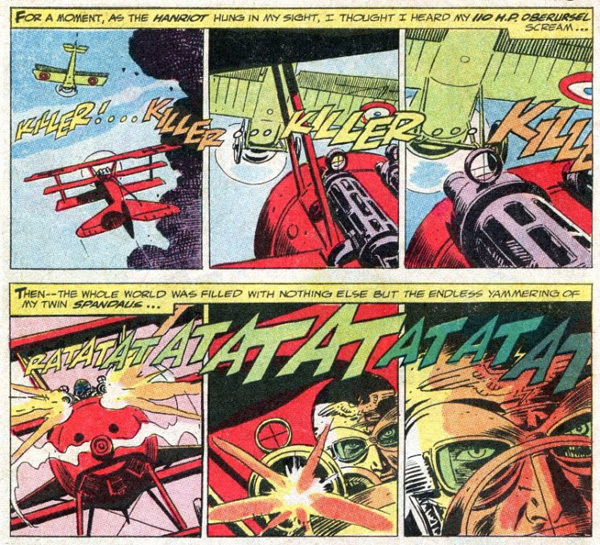 Kanigher invests a lot of thought in the mechanics of fighting in the air, with the first strip showing Enemy Ace concealing his plane above a zeppelin (a trick Kanigher repeats), and is eventually forced to vary his plots, or at least conceive twists on his standard elements. The best strip relies heavily on the code of honour between fighter pilots of opposing nations, a concept Kanigher always accentuates, with von Hammer saluting any valiant defeated opponent as their plane spirals to Earth. The story of the Hangman sees von Hammer for once downed, and rescued by his enemy to be nursed back to health as each believes the only honourable way to settle their differences is in the sky. It’s an archaic chivalry almost beyond understanding today, but also indicative of how on both sides during World War I it was the upper classes who flew the planes, already signified by the ‘von’ prefix for Enemy Ace. Another good story exploits that, with the Bull rejecting honour to achieve certainty with his kills. 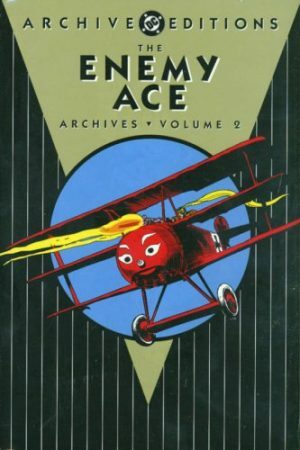 In the mid-1960s Enemy Ace flew in the face of traditional war comics by presenting a hero who carried out his duty, but saw no glory in war or triumph. 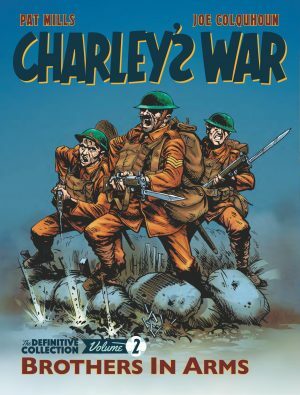 Kubert’s contribution is obvious from the start, but due the repetitious nature of Kanigher’s earliest strips it’s not until halfway through the book that the reason for the feature’s high regard begins to clarify. The best of these stories still read very well, and more follow in volume two.